The greeting card company, Treat, is having a one-day sale on July 4th cards. You can get unlimited July 4th cards from Treat for only $0.99 (that’s 67% off!) by using the promo code TREATJULY4. Here are a couple of our favorites below, but you will want to check out all of their designs here. And remember promo code TREATJULY4 to get them for only $0.99. *HOT* Foster Farms Lunchmeat .55/1 Printable Coupon! Print this Foster Farms Tub, Deli Slices, Bologna, Variety Pack or Other Pre-Sliced Lunchmeat .55/1 printable coupon quickly, before it disappears! This should make for a great deal, especially at stores that double coupons. Remember, you can print each coupon twice. 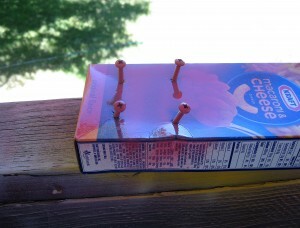 Lysol Scrubber Sponges .50/1 printable coupon! Print this Lysol Scrubber Sponges .50/1 printable coupon quickly, before it disappears. My local Walmart has the 4 pack for $2.97, so just $2.47 after coupon. This may be an even better deal if your local grocery store doubles coupons. Remember, you can print each coupon twice. Gap.com – Save an additional 25% off sale items! Shop Gap and save an additional 25% off sales items. Use code GAPEXTRA. Ends 6/24! “Toy Story Showtime!” is a Disney Learning interactive storybook designed to help children explore essential early reading concepts. Kids are invited to join Buzz Lightyear as he sets out to impress Jessie the Cowgirl in the talent show. As Buzz tries his luck at everything from comedy to juggling, emerging readers discover new vocabulary words in the context of a rich, interactive storytelling experience. Bonus activities encourage children to use the vocabulary in both guided and exploratory play. Payless Shoes BOGO 1/2 Off! Plus 20% off code! Cute sneakers! Take 20% off your order with coupon code 72502. Shop the latest styles and save 1/2 off your second item of equal or lesser value, excluding green tagged incredible value every day product, through Monday, July 9th. Free Shipping to a store near you. $5.95 Flat Rate Shipping to your home or office. 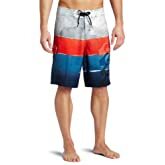 Up to 50% Off Men’s Board Shorts – Today Only at Amazon! Today only, save up to 50% on the latest men’s surf-ready board shorts from Volcom, DC, Hurley, and more. Discount offer applies to only items shipped and sold by Amazon.com. This offer is valid today only, June 23, 2012, and while supplies last. *HOT* Toy Printable Coupons! HURRY! There are some great toy coupons on Group A right now! Print them quickly, before they disappear! Remember, you can print each coupon twice! 51″ x 34″ Extra-Large Fine Classic Art Prints – Choose from 9 Timeless Art Prints! 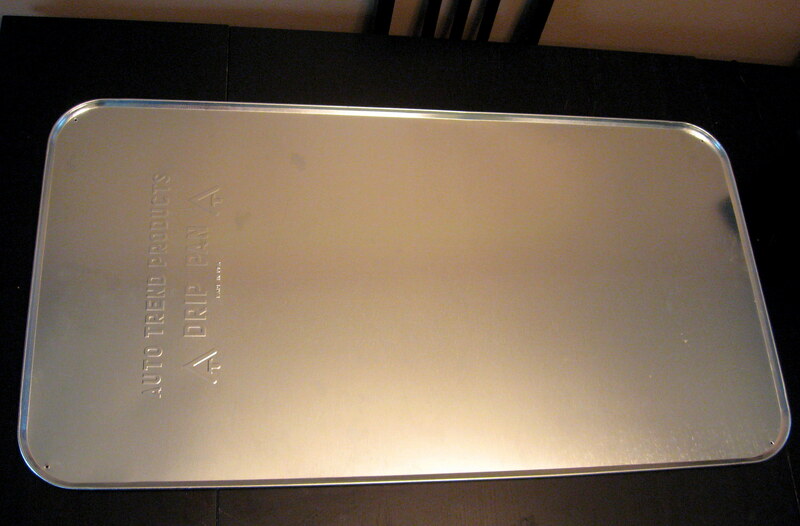 They look like an enormous cookie sheet, but they are drip pans to put under your car. They are big – about 2′ X 4′ – and you can get them at Walmart for about $11. 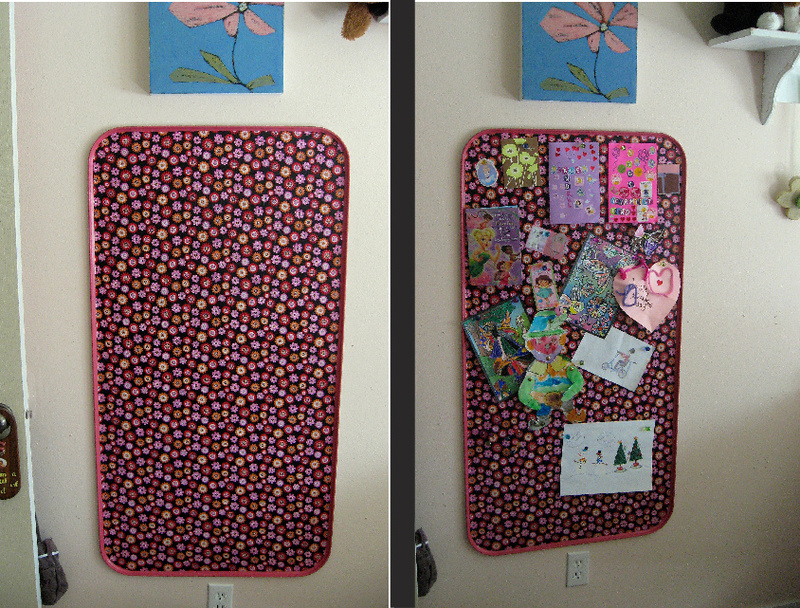 I have had one in my craft area for awhile that I use as a magnet board. I needed one for my daughter’s room, and loved the size of these, but I knew the silver wouldn’t work in her pink room, so I pulled out my trusty Mod Podge and went for it! 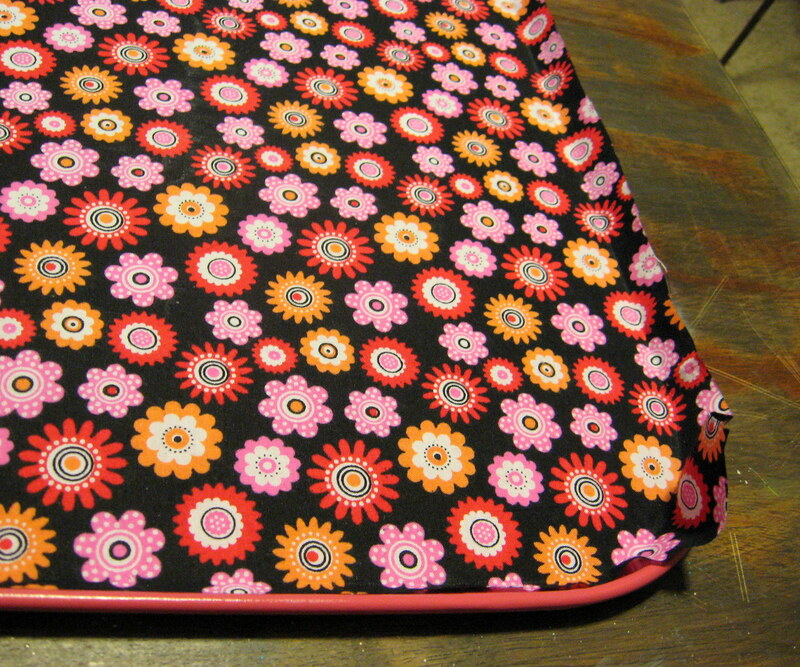 I started by cutting my fabric into a rectangle just a little bit larger than the dimensions of the drip pan – maybe an inch or so. 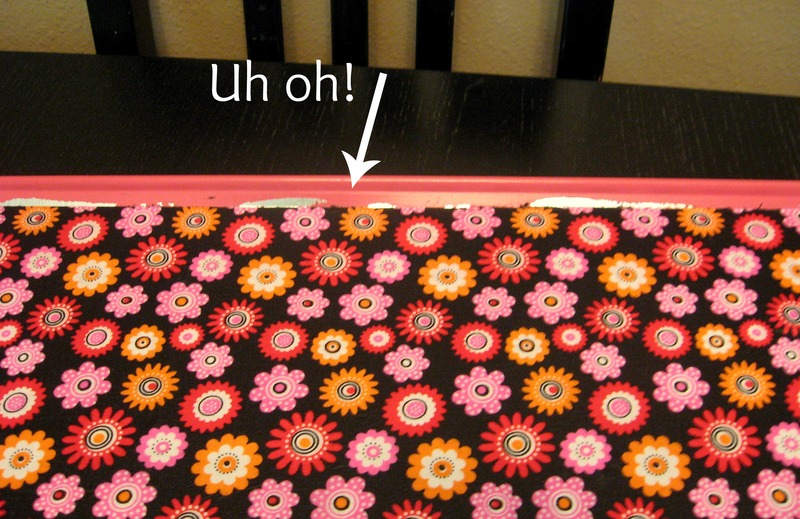 The fabric will stretch a little as you Mod Podge it on, and you will cut off the extra when you’re finished, so you really only need to make sure that two adjacent sides are square and straight. If you have a rotary cutter and mat, you’ll want to use that. I don’t, so I used a carpenter’s square to mark it, then cut with scissors. 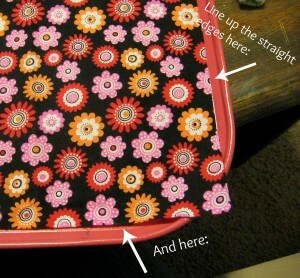 You only need to do the edges, since the middle will be covered with fabric. I recommend using a high quality paint to lessen the chance of it scratching off of the metal. I like Krylon. Once the paint is dry, find a big work space, make sure your kids are occupied and pop in a movie. 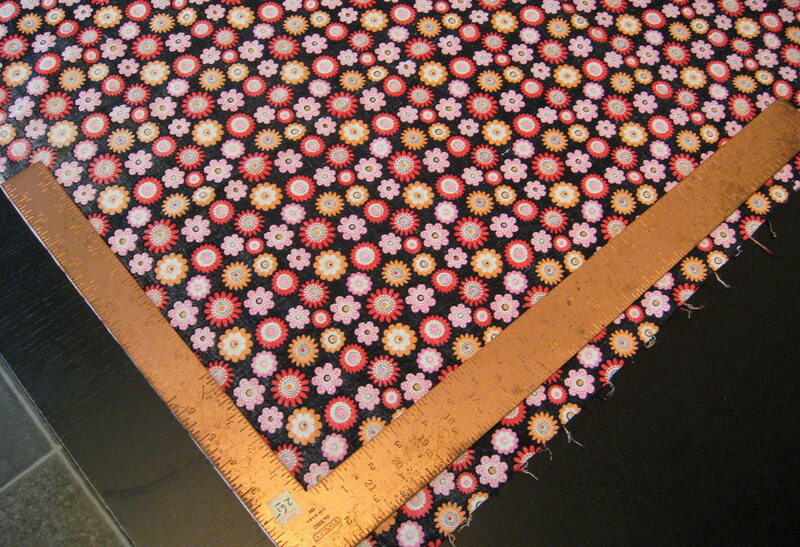 Mod Podging fabric is a little trickier than paper and will take a little time and patience to get it all straight. 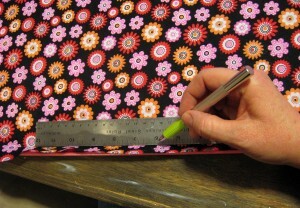 Start by lining up the two edges of your fabric that you cut straight with two adjacent sides of the pan. The corner will extend over; don’t worry about that yet. 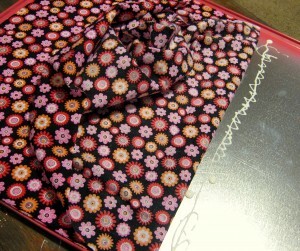 Once the fabric is all laid out and lined up with the edges, gently fold back the end and start applying the Mod Podge to the tray. 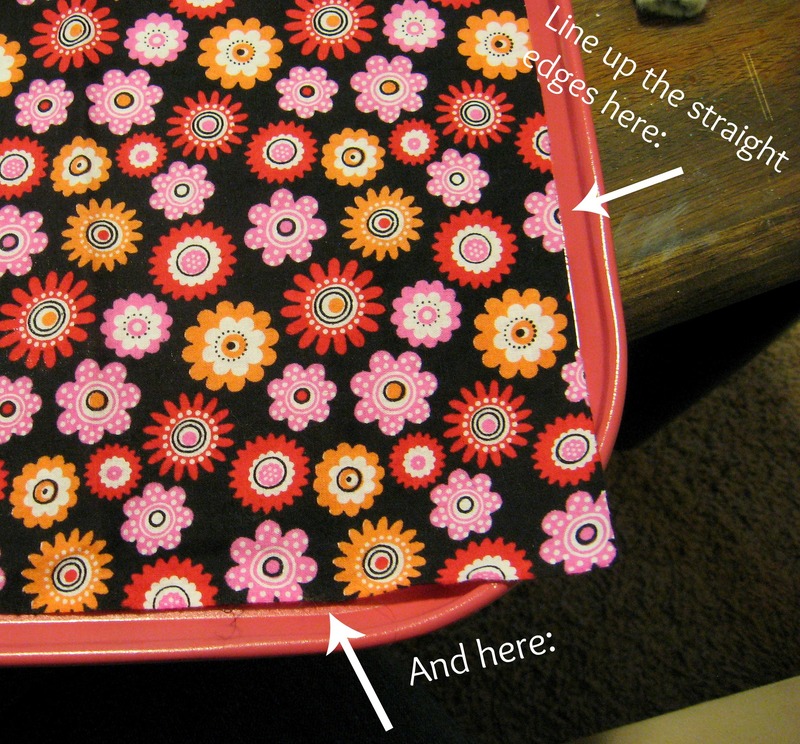 Start with the corner that you just lined up, then work your way across the short end of the tray until you get the fabric on that whole end adhered. Apply a few inches of the Mod Podge, then rub it down with your fingers until it is stuck. 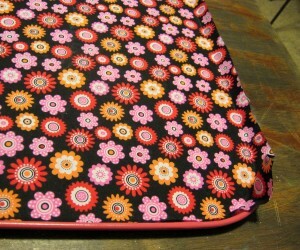 Then gently fold back more fabric, apply more Mod Podge, rub and repeat. 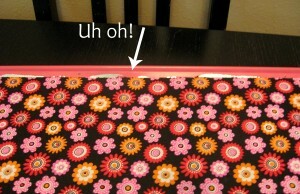 Make sure you are not leaving any spots under the fabric without Mod Podge. Once you get a strip across the whole short end adhered, leave it for 15 minutes to dry before you continue. If that first strip is lined up and attached well, the rest of it will be easier. 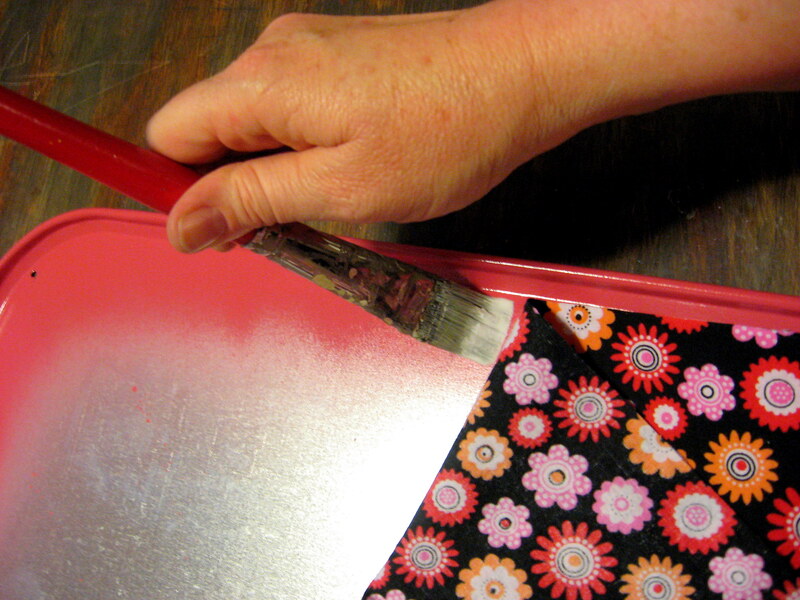 Continue rubbing it with your hands (or a brayer) as it dries to make sure it dries flat and smooth. and then spread it with a paint brush. again, making sure not to miss any spots. Fold the fabric over the Mod Podge – carefully lining up the straight edge (remember the other edge will extend over at this point) and rub until it starts to dry. 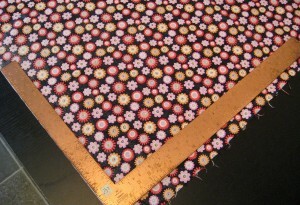 Let that dry thoroughly, then you are ready to cut off the excess fabric. I used an exacto knife and a metal straight edge on the straight parts, but I just free handed it around the curved corners. Oops. Fabric pulled the spray paint off with it in some spots. SO – learn from me when you make yours and either 1) Mod Podge the fabric on first, then tape it off well and spray paint second. 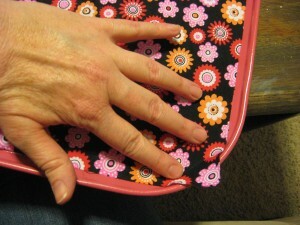 or 2) Be very careful as you are brushing the Mod Podge on and don’t let it go up the sides of the pan. But, in case you find yourself in a similar place and need to fix it, this is what I did. 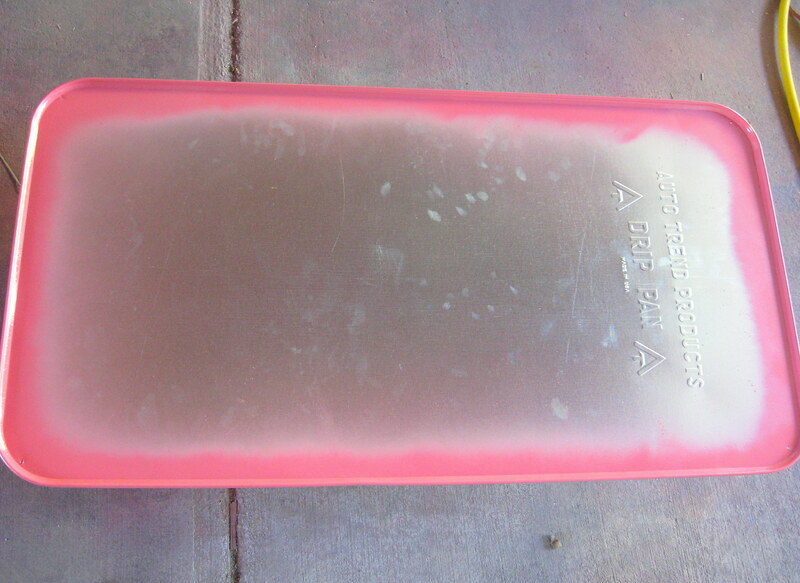 I sprayed some spray paint into the bottom of an empty butter tub- hold it close to the bottom and spray for a minute so that you get a really concentrated stream and end up with some liquid paint. Then I just used it like regular paint with a small paintbrush to paint over the mistakes. Once that’s dry, give the entire pan a top coat of Mod Podge. 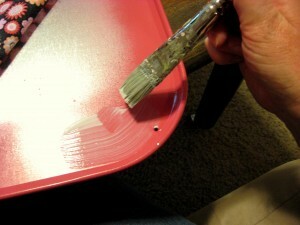 Be sure you go up on the sides of the pan too to protect the paint from scratching off. 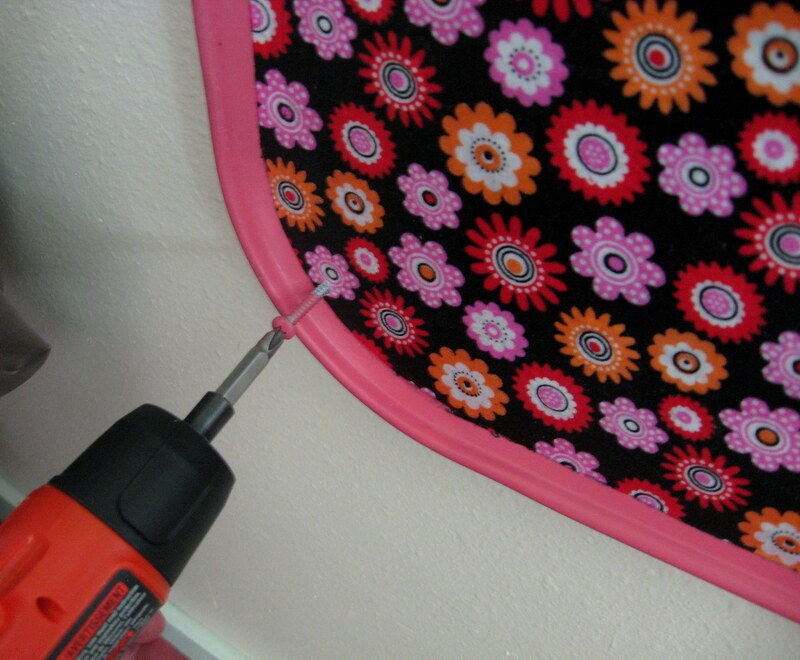 then just screwed it into the wall (a drill bit in an electric drill will go right through the soft metal of the drip pan). Done! 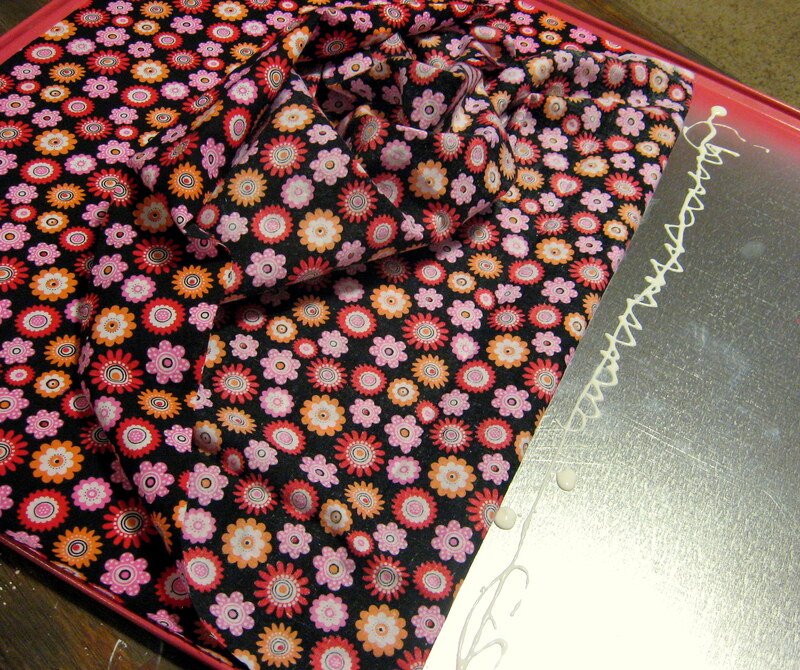 I was worried that the layer of fabric would compromise how strong of a bond I would get with the magnets, but it didn’t; even the heavy birthday card from Grandma that plays that annoying charming and delightful song stayed put. Select Lincoln (Nebraska) as your city. You do not need to live in Lincoln to purchase this deal! This is a SIDE DEAL. Readers Digest Magazine Subscription – Just $3.99! Inspiring Stories, Famous People, and Money-Saving & Home Decorating Tips!